Twisted wire brush trees are another really great tree to add to your collection. Many readymade trees are based on some sort of twisted wire brush design. If you look around there is a very wide variety of readily available brushes just waiting to be made into trees. Many of these can be purchased at discount stores for a very reasonable price. For starters we will look at a type of common household cleaning brush. This particular one is designed for cleaning window blinds with. Almost any brush that is made with a central core of twisted wire will work for this. Using a new brush is frequently preferable (especially if you are using one of those looped toilet brushes). Step one is to cut the brush into tree sized lengths. The size of the brush you start with and the size of the trees you finish with have a great effect on the cost of the individual finished trees. Keep this in mind when selecting your brushes since the whole point is to make them for cheaper than you can buy them. Next you need to shape the brushes, to do this we used a pair of pliers and some scissors. The lower trunk was formed by simply pulling out the unneeded bristles to a suitable height. Then, while using the exposed tree trunk as a handle, shape the tree with the scissors, turning it between cuts. The trunk is then glued down to a base, painted, and flocked. Another commonly available type of brush is the ones used to make Christmas wreaths. These come in a very wide range of qualities. In this example we will be using a very cheap one for demonstration purposes. 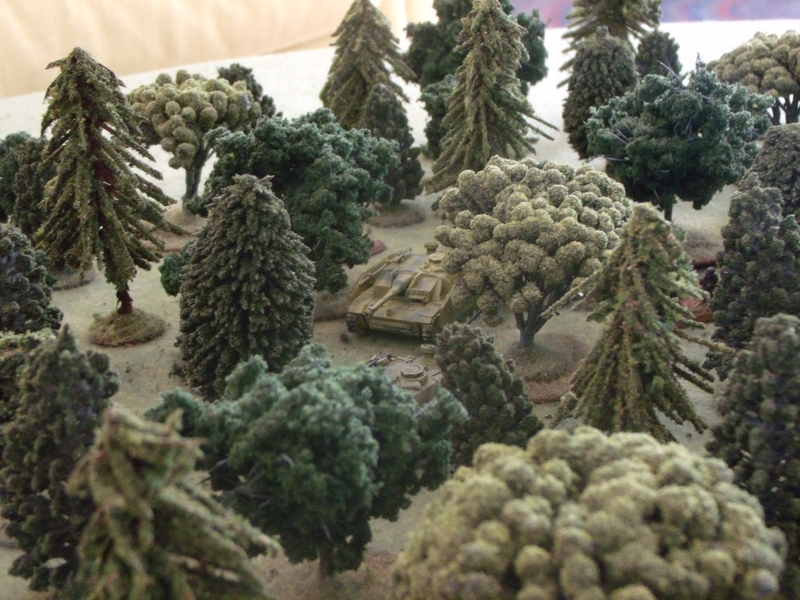 If you need to cover an entire table on a very small budget then these are the trees for you! This wreath was bought on sale for about $5, and provided enough armatures to cover an entire 4’ X 6’ gaming table. Another benefit of using these types of brushes is that the bristles don’t come straight out from the wire. Instead they come out at an angle, which gives you the option of making the trees with the branches pointing up or down. The shaping process is essentially the same as the other brush trees, with the minor difference of clearing the trunk using scissors instead of pliers since the strands are usually much harder to pull out. Once again simply glue the armatures down to a base, paint and then flock.